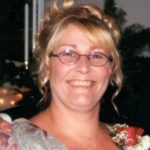 Jane Ann Lambert-Cox, 57, of Hawesville, Kentucky, was sent home after her courageous battle with cancer, on January 7th, 2019 in Lewisport, Kentucky. Jane Ann was born March 9, 1961 to Walter and Mary Ann Lambert in Madison, Indiana. She attended Tell City High School and worked at the family owned Tell City Dairy Queen for many years and the Ohio Valley Surgical Specialists. Ann loved to travel and resided in 8 different states. She also enjoyed preparing delicious home cooked meals for her family where her recipes will continue to be passed down to her grandchildren. Ann was a member of Blackford Baptist Church. Surviving are her children, Elizabeth Anderson (Shawn), Amy Cox, Taylor Cox (Marina); father, Walter B. Lambert; siblings, Scott Lambert (Diana), Amanda Lamar (Grant), Kathy Pyle (John); all of her beautiful grandchildren, Alex, Lilly, Libby, Xavier, Avery, Xander, Xion, Jolie, and Octavia; many aunts, uncles, nieces, nephews, and cousins. She is preceded in death by her mother, Mary Ann Lambert; grandparents, Addison and Mary Jo Smith and Walter B. Sr. and Mary Lee Lambert. A memorial service will be held at 11am Saturday, January 12 at Zoercher-Gillick Funeral Home with burial in Greenwood Cemetery. Brother Chad Swihart will officiate. Visitation will be from 9 - 11 am Saturday at the funeral home.